Video clip synopsis – In 1912, Mawson's expedition arrived in the Antarctic. Little did they realise it was the windiest place on the globe. Broadband MP4 mawson_bb.mp4 (7.5MB), suitable for iPods and computer downloads. 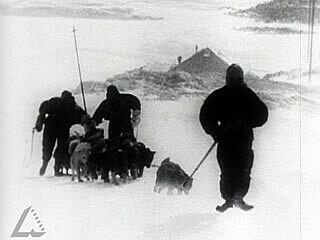 Mawson’s Expedition to the Antarctic is an excerpt from the film Antarctic Pioneers (30mins), produced in 1962. Antarctic Pioneers: One of Australia’s most famous photographers and explorers, Frank Hurley, narrates this absorbing film on the history of Australia’s first expeditions to the Antarctic continent between 1911 and 1954. It includes remarkable, original footage of the expedition on the tall ship Aurora in 1911, the Campbell expedition in 1947 and the Law expedition in 1954. Much of this film was made by Hurley when he accompanied Sir Douglas Mawson and an Australian party to the Antarctic in 1912, and on later expeditions. The program traces the history of the Australian expeditions between 1911 and 1914 and the establishment of Mawson Station. A rare film which reveals the true hardship and courage of these early pioneers. Antarctic Pioneers was produced by the Commonwealth Film Unit with the co-operation of The Australian National Antarctic Research Expedition. There are 26 nations that claim parts of Antarctica as their territory. Australia is the largest, claiming 42 per cent of the total area. In 1911 Douglas Mawson led the first Australian expedition to Antarctica. His aim was to map and explore the coastal area of Antarctica closest to Australia. Mawson selected his team and in the ship Aurora they sailed through 1500 kilometres of pack ice to the Antarctic coast. In spring 1912, several parties of explorers set out on foot from their camp. Mawson led the team comprising Swiss scientist Dr Xavier Mertz and Lieutenant Belgrave Ninnis. A team of greenland huskies pulled their sleds. Mawson’s party travelled east for over a thousand kilometres mapping the coastline, collecting geological samples and discovering huge glaciers. Fighting appalling weather and poor light, the trio had to drag themselves and their supplies around crevasses and slippery, ice-covered rock. Five weeks into the journey Ninnis disappeared down a deep crevasse along with a team of dogs and the sled carrying most of their food. Mawson and Mertz had to turn back and, in order to survive, they were forced to shoot and eat the remaining huskies. Mertz became sick and increasingly weak from the toxic levels of vitamin A in the dogs’ livers, and he too died. Mawson was near death – his feet were bloody, his skin was falling away and he had lost a lot of weight. List eight points you observe about the Antarctic from the video clip. In small groups discuss and write answers to the following topics. What is the overall image of the Antarctic environment that you get from the video clip? How does the filmmaker use narration, visual images and sound effects to create this image? Find at least three different examples from the video clip. Describe the attitude you think the early explorers had towards the environment. For example, do you think that they wanted to conquer the environment or just find out as much as they could about the geography? Describe the messages you think that the filmmaker is trying to convey to the viewers about humans’ relationship with the environment and human endeavour. One of the values of many people today is a belief in ecological sustainability – having as little impact as possible on an environment. Do you think the pioneer scientists of this video clip shared that value? Write a 100-word explanation and include comments on aspects such as the use of animals, attitudes to wildlife, use of technology to help you work out an answer. The film was made in 1962 from original footage shot in 1911–12. Imagine that you are a modern filmmaker making a five minute film about Mawson’s expedition and the Antarctic environment. Research the Antarctic environment and Douglas Mawson and construct a list of twenty facts. Write a summary in point form of all the images and facts you would include in your film. Describe in one or two sentences the messages you would like the viewers of your film to understand about the Antarctic environment and Douglas Mawson.